He’d always been a student of the game. At the institute, he became well known for the time he spent off the floor watching the techniques of his classmates. He would hone in on their fingers and footing, watching for the slightest tactics that could make him faster, more effective, all while rolling a quarter delicately over his knuckles to increase his dexterity. His eyes would become sharply narrow, making sure not to miss any minor idiosyncrasy that could give him an edge. The others called him “Hawkeye.” They wanted to give him a name they’d remember when he made it to the show. They never had a doubt that he would. After his time at the institute, he spent a few years working through the minor league circuits. He picked up a job in Bakersfield and learned to condition through the suffocating desert heat. On off days he would go outside with a beer and a pair of scissors and sit on the patio of his florescent 80s apartment complex. By the time the drink in his left hand was finished, his right would be sweating enough to make arduous the task of extensive digit mobility. Fighting against his own slippery physical flaws, he would jab and weave through an old phone book. By the end of summer he could estimate an inch and a half of hair and perform a perfect cut on the white pages in less than ten minutes. He worked this circuit for four years, averaging an astonishing thirty cuts a day. The regulars to his chain salon subsidiary rested comfortably with the knowledge that he would always know the “usual,” that he would adjust to their current hair length and make the appropriate assessments based on his encyclopedic knowledge of the human scalp. His influence exceeded fashion. He didn’t need a magazine or celebrity game show to tell him what was in demand. All he needed were his instincts. They were the same ones that told him to immigrate to America, the same that brought him through a scholarship program to the illustrious Miesner Institute, and the same that told him that one day he would get the call. When A-listers and congressmen were looking for a haircut, he would be the one who could trim their tresses and tufts without hesitation. One day he’d reach the show. In 2005 he thought that he’d made his break. The Bakersfield DA was in a rush before a hearing and couldn’t get an appointment with his regular barber. He called the salon on a whim, emphasizing the expediency necessary for this most vital haircut. Hawkeye’s heart never sped up, his sweat glands poured less vigorously. When he finally hit the floor, the poetry of the moment was one that records and statistics couldn’t capture. His peers knew that he was a major player in the minor league system, but never before had they seen such impeccable footwork. His sideburn and neck hair judgments were astounding. And the tempo—oh my God. The DA was in and out of the salon in twelve minutes exactly (a rookie to the salon knew that this was something special and set up a timer for the occasion). Hawkeye knew the DA would tell his friends. He convinced himself that he’d get the call from the true designers in the hair game. The big guns in Los Angeles would catch wind of a cut like this. He could already see his family portrait and beautician certificate sitting confidently in the marble countertopped salons where the tips flowed like wine and the customers provided a challenge and flair unseen in his early work. This was his watershed moment. It wasn’t pure tragedy though. This was still one of the four dollar tip years, before prices had inflated to seventeen or eighteen dollars and people did not find it necessary to augment their twenty dollar bill with an appropriate accessory. It was simply more suave to drop a twenty on the counter and walk out. But 2005 was a different time. Hawkeye could provide for his family and their modest apartment life on his minimum wage plus tips work. He’d work six days a week, usually taking Sundays off to go to church with his wife and infant daughter. He didn’t really need the show, it just sounded…nice. His broken English had improved less astronomically than his haircutting ability, but he was getting better every day at relating to his customers and providing a positive experience. He may not be a lead rotation guy at any of the major salons, but he could provide some solid spot relief if they’d give him the chance. And so he studied the game, eyes ablaze with the Xs and Os that he earnestly believed would bring him some souvenir of success. His dream wasn’t Cooperstown or Canton. It was that picture of his wife and daughter perched triumphantly on a major salon floor. Sitting quietly in a modest home with a manicured lawn, their Taiwanese accents practically tearing away from the photo, reminding every upper-class American who walked through the door that the land of the free also was the home of the brave. He would reach out to them through jet black eyes and will them into seeing the beauty in his narrative. He would cut quickly, efficiently, and with magnificent flourishes of style, and when he cut he would cut straight to the heart. Quick, efficient, hawkish. 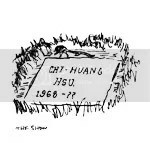 His headstone would not read “most valuable stylist” and would not say “Hawkeye.” It would read Chi-Huang Hsu, 1968-? ?, Taiwanese Army, a loving husband, father and a joy to his homes in both Taiwan and America. It would say nothing of his prodigious talent or his unrelenting devotion to his profession. It would bridge the gap between the Xinbeizhen Community Hospital and the Los Angeles National Cemetery and forever engrave Hawkeye into the histories of his two nations. Death would be his Cooperstown, and each passerby would oblige him a new induction ceremony—a Taiwanese soldier on an American military burial ground. And when children walked by and asked why he was buried there, parents would smile and tell them. —Travis Bill: when he’s not writing, Travis enjoys organizing underground cockfights, running in slow motion, and pretending he’s Tom Selleck. You can also find him fighting radio mediocrity on KALX as Bungalow Bill or reviewing concerts for the SF Weekly All Shook Down blog.